TEMPE having a large variety of cooking like french-frying and salad. 1. Mix 1L of water with 50cc of vinegar, and stir well. Steep soybean in it all night. 2. The next day, exchange water and skin soybean. 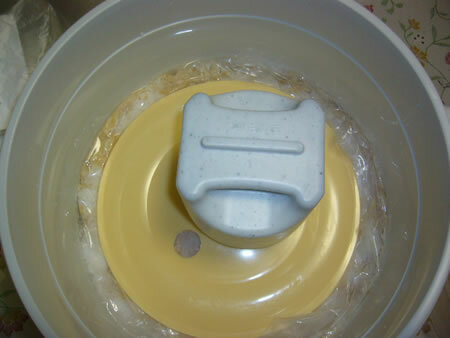 Do not remain skin beacause bacteria easily propagate around it in incubating. It is no matter if soybean splits. 3. 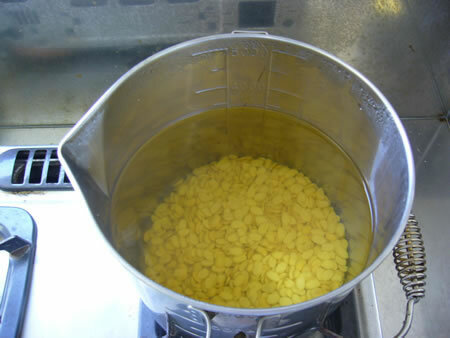 Boil soybean in a pot for 30 min~ 1hr, until beans become soft. 4. Cool boiled soybean into 35～40℃. 5. 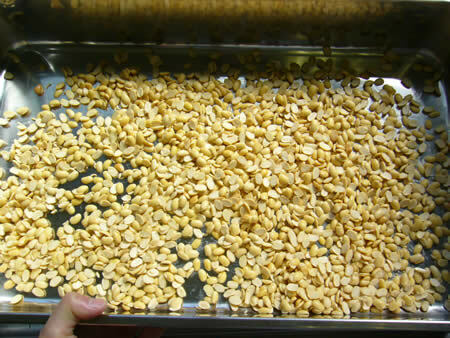 Crush TEMPE fungi and mix it well with boiled soybean. 6. 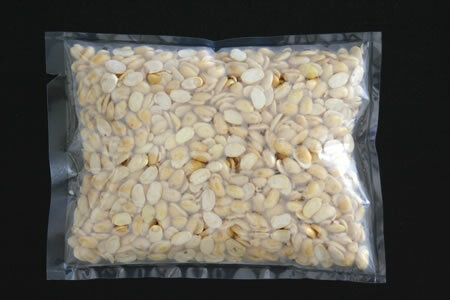 Put soybean into plastic bag punched by picker or punch. 7. Put plastic bag on gauze in vat poured water. 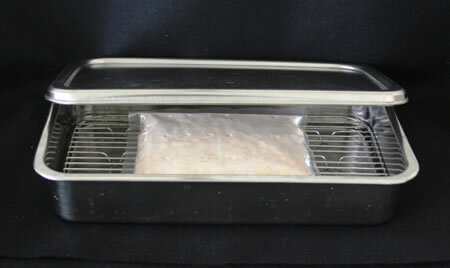 Incubate it at 28～30℃ for 20 hrs. 8. Surface of soybean is gradually covered with white hypha. 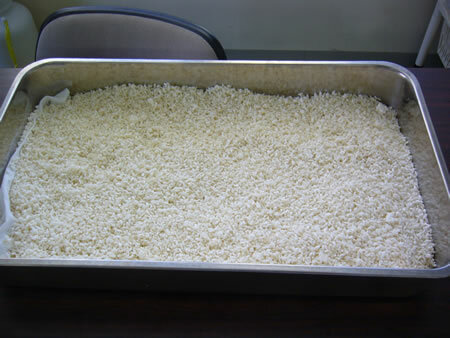 Give rice a rinse until water settles. Steep it all night. 2. 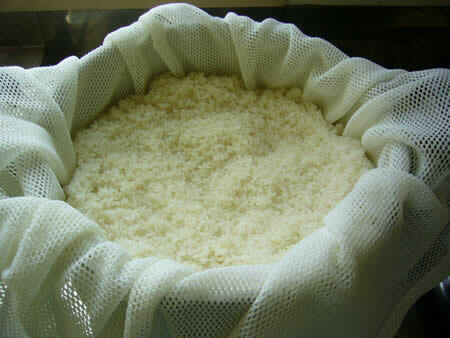 Put rice on bleached cotton in a steamer and steam for about 50 min, until going core. 3. 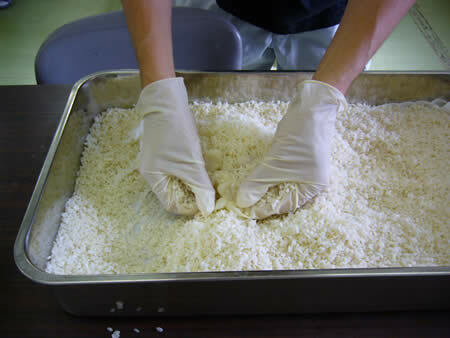 Spread steamed rice on cloth and cool it at about 45℃. 4. 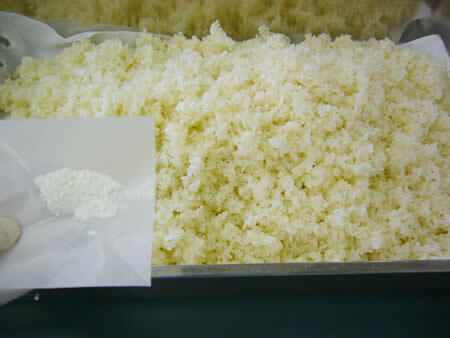 Dust Tane-Koji on steamed rice and mix well. 5. Next morning, rice will somewhat be white. Disentangle rice well and keep it warm 1 more day. 6. The third morning, it will finish. Disentangle it again. The shelf life is about 2 weeks in refrigerator. 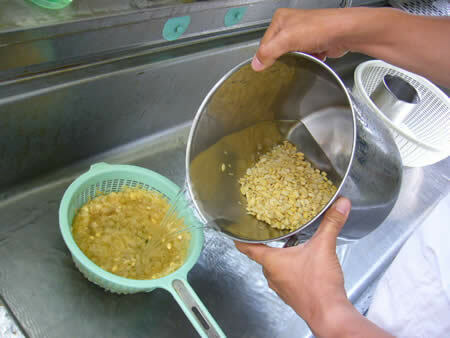 ※Miso must be what is not heated for sterilizing, because of that, enzymes are still active. 1. 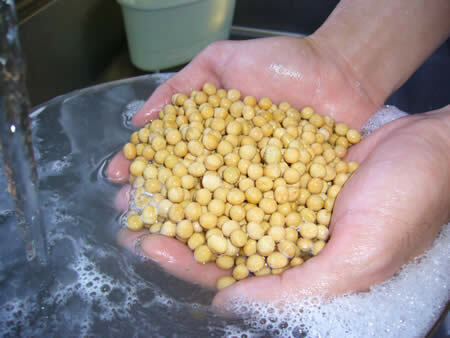 Give soybean a rinse well and steep it in 5 times volume of water all night. 2. 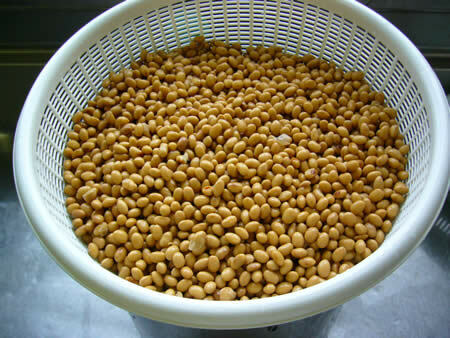 Boil soybean for 3~4 hrs in a pot, until soybean become soft. After coming to the boil, boil over a low or moderate heat. 3. Cool boiled soybean at about 45℃. 4. 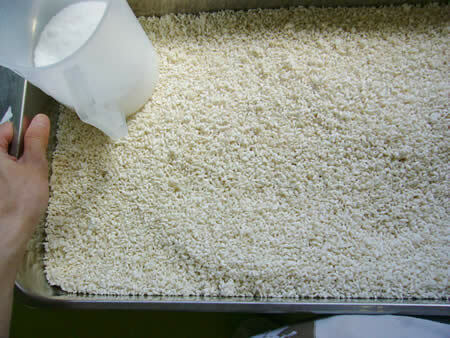 Mix rice-Koji with salt well during boiling soybean. 5. 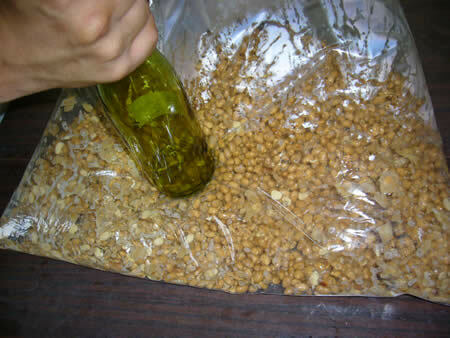 Put soybean into plastic bag and mash it up by bottle of beer etc. 6. 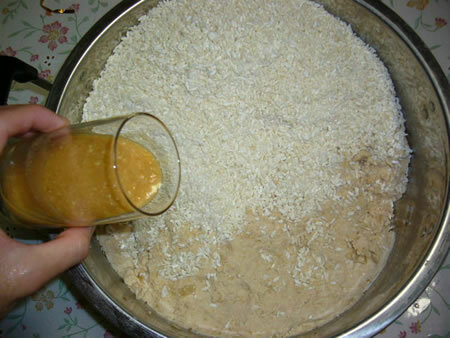 Mix mashed soybean with Koji mixed salt, 400g of salt, water taked raw Miso up. 7. 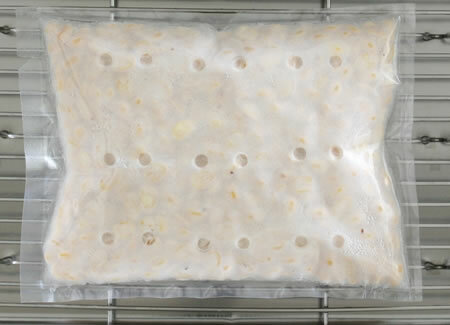 Spread plastic bag in plastic container, and put (6) in it without air. 9. Wait for half a year to a year with weight. Finish ! It is possibｌe to say that we never have good feeling about "molds". They grow in food, on wall and in bathroom…. They have bad looking and we are revolted by them. It is not too much to say that molds are hate. 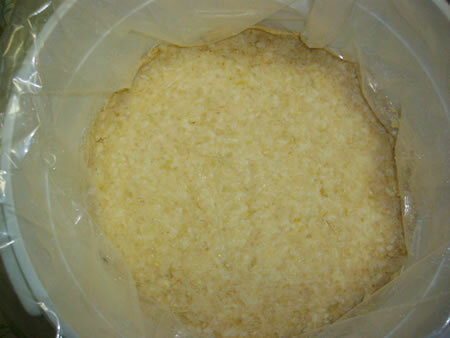 Surely, we cannot deny that, but a lot of medicines are prepared from molds like well known Penicillin and fermented foods such as Miso (soybean paste), soy sause, Sake and Sochu are made with works of molds (Aspergillus oryzae). 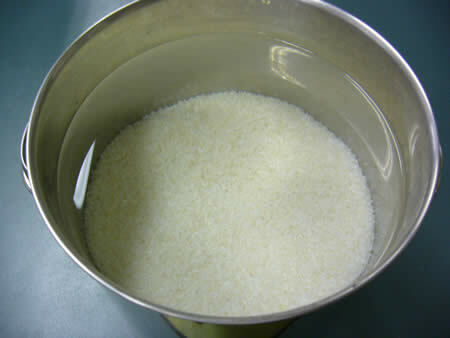 We can say that we eat molds and molds are covered with wide part in our heath and life. Molds appeared earlier on the earth than we. The time of that is said about 5 hundred million ago, that means molds are our senior on the earth. Molds are written "黴" in chinese character and there are some proofs of having existed 2 thousand ago at least. The passage about molds are in "説文静字", the oldest dictionary in China. The followings are written in it. The things gotten blue by a long spell of rainy weather are molds. This letter is formed from "黒", meaning black, and "微", meaning small. We can feel the character of molds by "黴". Mold is a part of fungi and is a commonly used name of colony of microbe. Mold builds circular colony and a lot of spores on its surface. Spore of Koji fungi is called Tane-Koji. 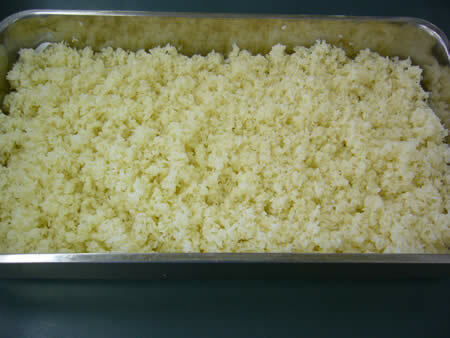 The reason why Koji is used for food is that constituents, taste, flavor, color of foods depend on type of enzymes. 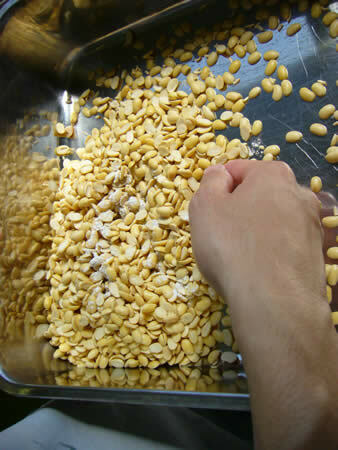 Enzyme is like sweat of Koji and it makes amino acids from protein and glucose from starch.